Update! Be sure to check out my new Next Issue review here. Next Issue recently killed readers’ ability to use its phone or tablet app to access a single magazine subscription digital edition, leaving only its monthly all-you-can-read subscription model for using its digital magazine app. The company’s unlimited access plans cost $10 or $15 per month, with the lower tier consisting of monthly periodicals and the “premium” plan including both monthly and weekly periodicals. Is Next Issue worth it? 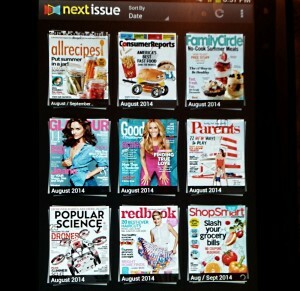 On the plus side, if you enjoy reading magazines, you’ll love Next Issue’s selection of over 100 publications. Their monthlies include Consumer Reports, Glamour, Cosmopolitan, National Geographic, Car and Driver, GQ, Good Housekeeping, Men’s Health, Ladies’ Home Journal, Money, Fortune and Prevention. 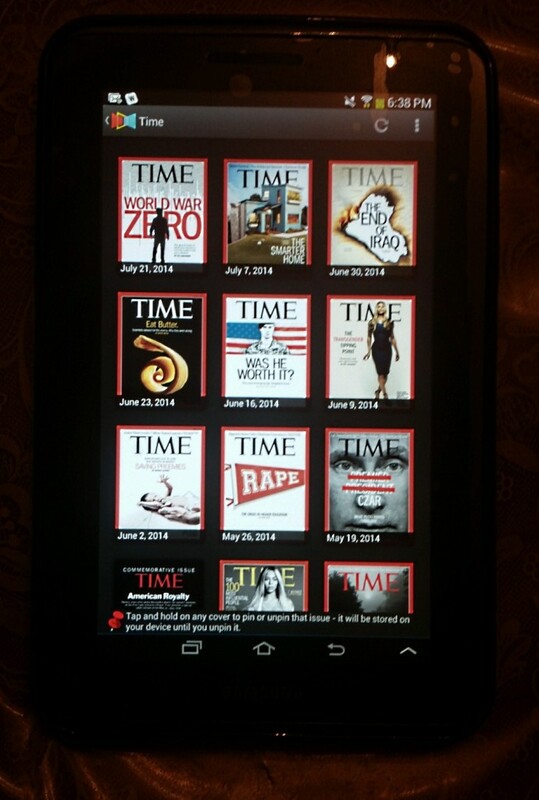 Weekly periodicals include popular stalwarts such as People, Time, Newsweek and Us. 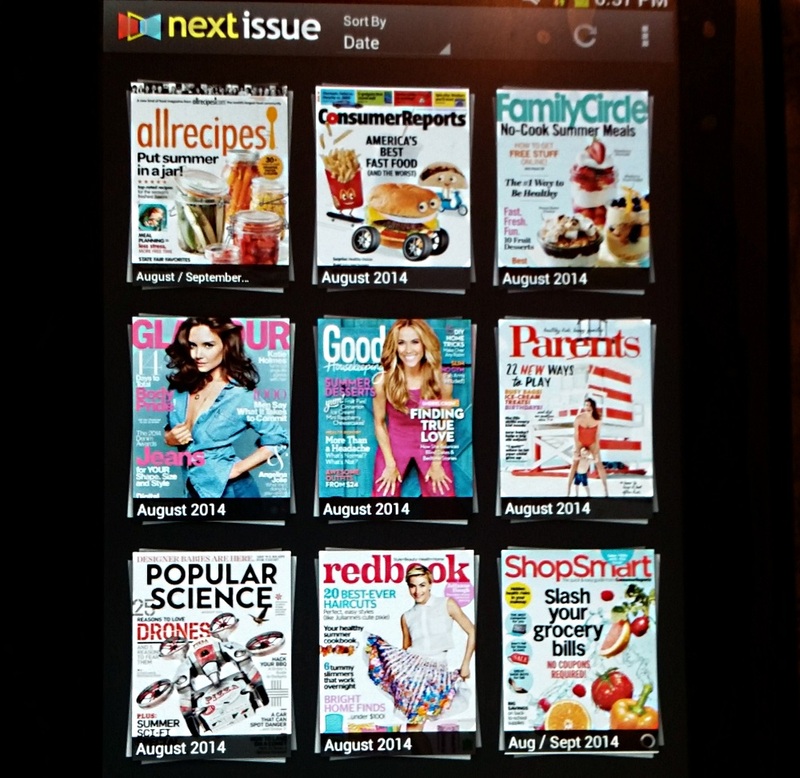 If you typically buy several magazines a month or subscribe to a few of them, Next Issue may seem like a bargain, letting you keep all of your magazines on your tablet for anytime reading. Next Issue’s large slate of online magazines includes only a couple of kids’ selections (National Geographic for Kids and Sports Illustrated for Kids) but features tons of niche publications such as Yoga Journal, Bicycling, Do It Yourself, Golf, Golf Digest, Runner’s World, Running Times, Successful Farming, Ski, Wood, This Old House, Popular Mechanics, Popular Science, Popular Photography, Organic Gardening and Shutterbug. You also get tech magazines like Geek, PC Magazine, PC World and Macworld and cooking publications which include Saveur, Vegetarian Times, Food Network Magazine, Every Day with Rachel Ray, Eating Well, Cooking Light and Allrecipes. If you want to try Next Issue for yourself, you can sign up for a free 30-day trial of a Next Issue unlimited access plan, letting you read any of the company’s library of 135 magazines. However, with this link you can sign up for a special free 60-day trial of Next Issue. It Next Issue worth the money for a monthly subscription? The service and its Next Issue digital magazine app come with a number of caveats that you should consider before subscribing. Although you should be able to read “pinned” magazines offline, in practice, I couldn’t figure out a way to read magazines using the Next Issue digital magazine app without some sort of data connection – either mobile or Wi-Fi Internet. This means that you can’t read stored magazines on a long car trip or airplane flight, so it’s not the same as taking a stack of paper magazines with you in a tote bag. Page turning and overall performance is sluggish in the Next Issue app. You often see a brief “downloading” message when you turn a page. You may find this somewhat annoying if you’re used to reading Kindle books with instantaneous page turns similar to reading a regular book or magazine. Also unlike Kindle books, you can’t bookmark pages to refer back later, and the magazine issue often doesn’t return to your last reading point when you re-launch the application. You have to navigate (slowly) back to where you left off, from the very beginning of the periodical. Next Issue lacks any built-in way of clipping from a magazine as well, the equivalent of tearing or cutting pages in a real magazine. Later versions of Android let you take a screen shot by holding down the power and volume down keys for a couple of seconds, and free Play Store apps let you accomplish this on Android devices without this built-in capability. It does work, but it can become quite cumbersome if you find a lot of pages in a magazine that you’d like to keep for posterity or send to someone else. Of course, you also can’t clip coupons from a discount-heavy magazine like AllYou. Even magazines that people don’t buy predominantly for their coupons often come with much-desired discounts, such as the Gymboree 20 percent off cards which Parents magazine frequently includes. Next Issue drains battery life on a mobile device much more quickly than typical e-reading apps such as Amazon Kindle, probably due in part to the graphics-heavy nature of magazines. Digital editions of magazines have the same advertising as their paper counterparts, so you may need to slowly page through dozens of advertisements while while browsing articles. This battery sucking behavior is another reason Next Issue wouldn’t provide for good reading material on long trips. Next Issue’s magazines take up significant storage space on your tablet or phone, even though you can’t read them without an active Internet connection. 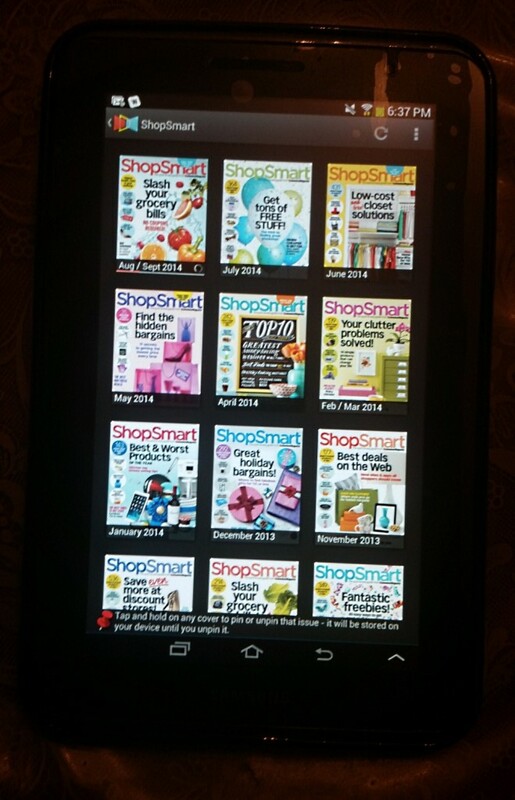 The app doesn’t give you a way of telling it to store magazines on a microSD card, either. If your phone or tablet has only 8 GB of internal storage and you already have a number of apps installed, you probably won’t have enough space for more than a few magazines downloaded at a time. Also, keep in mind that unless you cancel your subscription, Next Issue will begin charging your credit card as soon as your trial period ends.